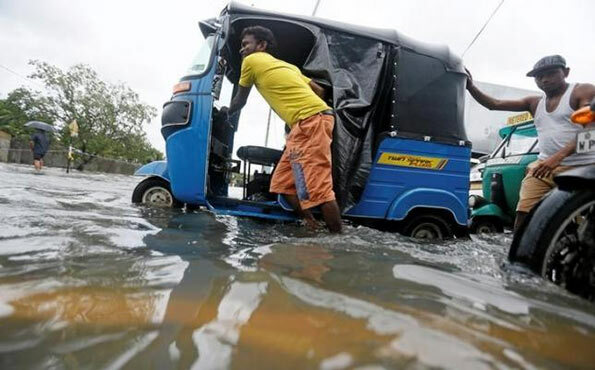 The cost of Sri Lanka’s landslides and floods will be between $1.5 billion and $2 billion at the minimum, the government said on Monday, as the Indian Ocean island struggles to recover from its worst natural disaster since the 2004 Asia tsunami. The official death toll has risen to 92 but 109 people are feared to have been buried in landslides. Days of torrential rain forced more than 350,000 people from their homes, though many were returning on Monday. Finance Minister Ravi Karunanayake said more than 125,000 houses and more than 300,000 small and medium businesses were destroyed or damaged. “This minimum damage cost does not include damaged vehicles, equipment and machinery. We urge foreign donors to channel their relief efforts through the government,” he told Reuters. The CB Governor should immediately conduct an auction for these funds. When the Bids come in (from the company belonging to his SIL at the last minute of the auction) the value of proposed bonds should immediately be increased tenfold to USD 15 billion at the highest interest rates received in the auction. Isn’t it a great pleasure to have an efficient SIL who will care for your offspring many decades to come.